This is a great breakfast recipe that we just enjoyed for supper! 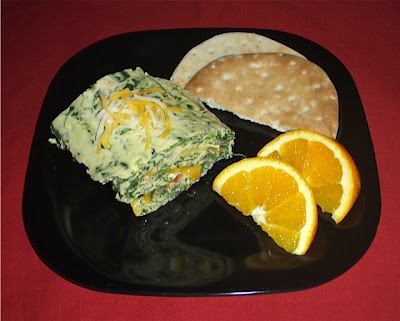 A fantastic low-point omelet rollup that's healthy and delicious. A terrific combination of tomatoes and cheese have been rolled up in this spinach rollup; but feel free to substitute your favorite vegetables and enjoy your own delicious version. Line a 15 inch by 10 inch baking dish with parchment paper and coat paper with Pam cooking spray. Set aside. In a large bowl, whisk egg substitute, eggs, salt and Tabasco sauce. Stir in spinach, onion, Italian seasoning, and crumbled bacon. Pour into prepared pan. Bake at 375 degrees for 15 to 17 minutes or until set. Turn omelet onto a work surface, peel off parchment paper. Sprinkle cheese and tomatoes evenly on omelet and roll up omelet starting with the long side. Slice into 5 equal parts. If you'd like a printer-friendly version of this recipe, Click Here.